In keeping with the spirit of Occupy Wall Street, Dr. Amit Goswami gets to the root of our global systemic problems. Most of us have by now heard Einstein's saying that we can't solve our problems with the same mind that created them. This is exactly what Goswami addresses in the latest of his many brilliant and path-creating books about quantum reality. In short, we can't solve the current issues that are threatening to destroy us -- because we're not in our right minds. If you haven't yet seen it, we highly recommend the movie based on his work, "The Quantum Activist." It's a charming and unexpectedly humorous introduction to the world of quantum physics, with which it behooves us all to become familiar. We're living in an age of transition similar to the one in which Copernicus proved that Earth revolved around the sun, not the other way around. And we can expect all manner of similar resistances, outrage, even penalties for embracing the new reality. But it's here, it's not going away, so we might as well get with the program because, ironically, it's really the only way out of our present complex and seemingly-insoluble problems. BoBuReview believes the topic to be so important that we're breaking the review of Goswami's book into two parts; Part One this month, Part Two next. And what on earth, you may ask, does the current global wave of protests have in common with quantum consciousness? Quite a lot, as it turns out. Because at bottom of the disquiet around the world is the realization that we have turned away from our own humanity, our true creativity, our spiritiuality. Yes, there, we said it -- the S word. For this is exactly what's missing from our major institutions, any acknowledgement that we are spirits in a material world. Goswami wants to turn that around, by proving the existence of God. Or you might call it downward causation, buddha nature, Source, or more explicity, quantum consciousness. "Science has discovered spirituality: there is now a logically consistent scientific theory of God and spirituality based on quantum physics and the primacy of consciousness -- the idea that consciousness, not matter, is the ground of all being." Firstly, Goswami points out one of the main ills besetting us, world-wide. " . . . we recognize that the current materialism-dominated structures of our social systems are heavily biased against ordinary people pursuing a meaningful life of creativity and transformation." And OWS is taking action to change the currrent paradigm from a life of thankless work to one of labors of love, i.e., doing what each of us is meant to be doing, according to our individual spirits. Idealistic? Spiritual? And yet also scientific? Yes. Do we create our own reality? Well, yes and no. Read on. "When we realize that consciousness is the ground of all being and material objects are possibilities of consciousness, then we also recognize the nature of downward causation: it consists of choosing one of the facets of the multi-faceted objects of the possibility wave that then becomes manifest as actuality." This is where Goswami clears up a lot of the confusion caused by the belief, as put forth in the 70's by physicist Fred Alan Wolff, that we totally create our own reality. "Do we have free will? To the extent that we can access our higher [not ordinary ego-consciousness] consciousness and choose from there [again, not from ego-consciousness], you bet there is free will, complete freedom to choose from the quantum possibilities offered in any given situation. Free will to choose the world as well as God and godliness, creativity as well as spiritual transformation." This is great motivation for meditation, because as the challenges facing humanity continue to escalate in number and complexity, we need a new kind of spirituality. "This is what quantum activism is about." Some of Goswami's radical and timely ideas include the belief that "we need to change our social systems in order to give people opportunity for transformation" instead of using their lives for mind-numbing work followed by mindless entertainment. The latter is a corporate agenda, not a human one. Goswami is after nothing less than transformation of the purpose of human life, from a form of materialistic, militaristic, machine-man into the infinite spiritual possibilities of quantum wo/man. Is there any real hope of this happening? Yes, indeed, and his book spells out many of the things that support his thesis in detail. "What is the relevance of introducing another kind of activism when activists everywhere seem to go nowhere?" It's because they have no new paradigms to offer and they're often stuck in personal contradiction -- peace marchers who get angry, environmentalists who drive SUVs -- or what he calls "lack of synchrony." Many early pioneers in quantum theory each contributed a significant piece of the puzzle. Heisenberg, Bohr, and even Carl Jung, with his "revolutionary new paradigm idea of synchronicity." 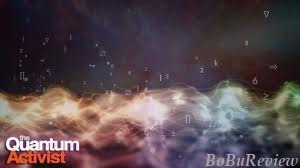 Largely accepted by modernity, synchronicity is based on one of the three main tenets of quantum physics, i.e., nonlocality, or coincidences due to a nonlocal cause. Even Einstein eventually gave quantum consciousness a nod by admitting that he "didn't discover relativity by rational thinking alone." In Goswami's chapter titled "Including the Whole Human Experience in our Science," he pays tribute to philosopher Ken Wilber, who was one of the first to point out the fact that in our obsession with objectivity, we left out the very things that make us human. Thoughts and feelings can't be measured, so therefore, they don't exist quantitatively. "What do we feel?" Goswami asks. We feel energy-like movements that material instruments cannot directly measure. In China, they call these movements chi; in India, they're called prana; and in the West, they're called vital energy. [Which was called orgone energy by psychoanalyst Wilhelm Reich; see Wright's autobiographical novel about growing up Reichian, "The All Souls' Waiting Room: Author's Preface." "The beauty of the new paradigm," Goswami writes, "is that upward causation of materialist vintage and downward causation that brings God [or quantum consciousness] into the picture are both, together, posited to give us manifest reality. Materialism and spirituality are integrated." In other words, we've waved goodbye to dualism. And without such an integration, we are only ever dealing with half our problems. If we cut out or ignore what really makes us most human -- our ineffable, unmeasurable spirit -- we will only increase our "materialist malaise," which is the basis for all our current global crises. 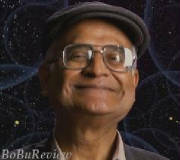 To "bring the lessons of quantum physics to creativity," Goswami's brilliant catch words are: do-be-do-be-do. In other words, we need to alternate between doing and being, combining the strengths of both doing [in the world] and being [in our minds]: activate and meditate. "We go on alternating between the be-mode and do-mode until we arrive, discontinuously, at our insights -- the solution." The phrase "quantum leap" refers to discontinuity, i.e., a thought that does not follow its predecessor. This is the very heart of creative thinking, and one of the great joys in life. The paradox of consciousness is that it is two-fold: "it is individual in our ordinary and conditioned ego, but nonlocal, or cosmic in the non-ordinary consciousness in which free choice is made." In Buddhism, this would be called the dance between the relative (material) and absolute (non-material) realities. 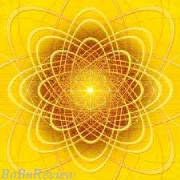 "Materialism, by taking the nothing-but-matter-is-real attitude, has led to the current conflict of science and religion . . . materialists have made it difficult to teach spiritual values to the masses, whereas their own quite unscientific materialistic beliefs (such as 'everything is matter') are taught freely in schools all over the world. Some religions have been so threatened by this that they have turned to terrorism to fight back" [or turned into turn-back-the-clock fundamentalists]. Goswami believes that the new view "will usher in a new age of post-secularism, in which spirituality is scientific, allowing a new dialogue and truce." Goswami calls on us to expand our areas of creativity from the selective to the collective, giving up our near-obsession with the product and focus in on the process as well. "Quantum physics says that objects are possibilities for you to choose from. Really, the primary ongoing question of your life is: are you going to choose the same-old, same-old, or are you going to explore new possibilities?" In his role as visionary revisionist, he believes that "creativity is our preparation not only for the new century or new millenium, but also for the next stage of our evolution . . . Materialism has become a wound on the body of consciousness, as a result of which the evolution of consciousness is now stalled." (Witness the materialistic oxymoron "corporate personhood.") "Will the wound become malignant? Or can we heal it?" See BoBuReview's Part Two of the review of "How Quantum Activism Can Save Civilization" for specifics on Right View, Right Action, and Right Livelihood.